Photographer Jeffrey Austin hosts a fun cocktail party at his studio home every Christmas. It is always a fun event. The guests will dress up or come in their own uniqueness. The most fun through the years was to see his son Liam. He is the cutest little boy. I always love how he is all dressed up. This little boy is going to break some hearts when he grows up. I thought of Liam when I was baking for my gang at the old office. 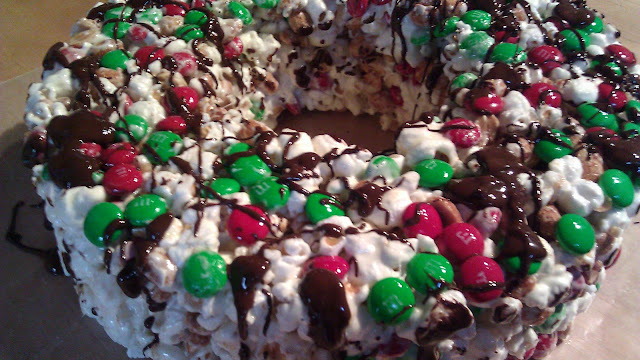 I thought it would be fun that he gets his very own treat this year, so I decided to make popcorn cake. 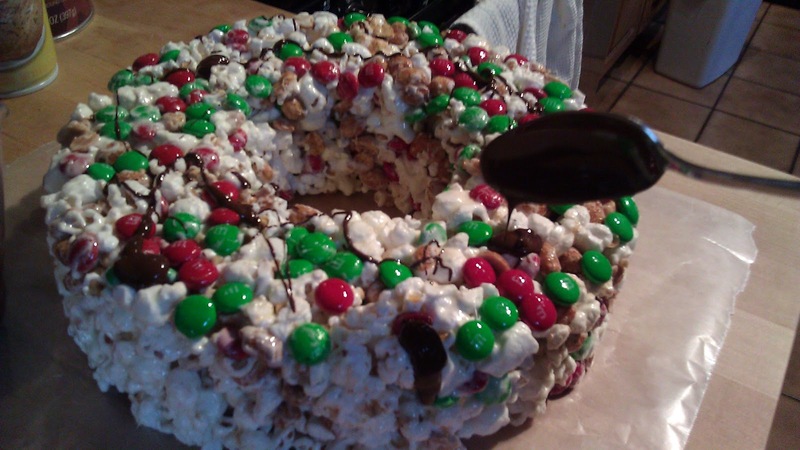 This is adapted from a recipe from Emeril's Miss Hilda popcorn cake. I modified it a bit. I use less butter and less marshmallows. I added Jelly beans since they looked like big light bulbs. Christmas can't be without those big old fashion light bulbs! I posted Liam's cake a few days ago and my fellow alumni at Chaminade is requesting the recipe, so Miss Moni, this is for you. By the way, it is a great recipe to do with a kid, so get Princess Bella ready for some kitchen fun. Note: I didn't put any jelly beans in this today. Some very big kid is going to eat this for me, I don't think his wife will appreciate the sugar high. Speaking of the food posted here, a few readers were wondering what I did with the food, did I eat it? The answer: if it is a small recipe, yes I will have it for dinner and lunch. 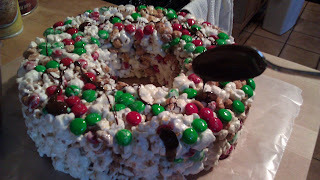 Just before you make the marshmallows "glue" sprinkle a few M&M and jelly beans on the bottom of the pan. The marshmallows will puff up and double its size. Remove from microwave and stir the butter and marshmallows together vigorously. Add the marshmallows "glue" to the popcorn, stir to combine. Add, candies and peanut quickly. Mix well. It will be gooey and sticky. You have to work quickly with this step. It would be helpful to have a "helper"
Spoon the mixture into the prepared pan. Cover with a piece of wax paper, press down to pack the popcorn. Cover with a fresh piece and set aside for about 2 hour for the cake to set. Melt 2 oz of chopped chocolate or chocolate chips in a microwave save bowl. Remove the wax paper from the cake, set a side, we are going to reuse this. Loosen up the side of the cake by running a thin knife along the sides. Over with the wax paper and invert onto a large plate or working board. Drizzle the cake with melted chocolate. Once the chocolate is set, remove cake from the wax paper. Wrap it up tightly with tinfoil to store, or slice into wedges and let the kids have fun!